I hope you guys have been loving my Tobi collaboration as much as I have creating and sharing the looks! Today I'm back with the third and final look, the Walk In the Park Gignham Jumpsuit. 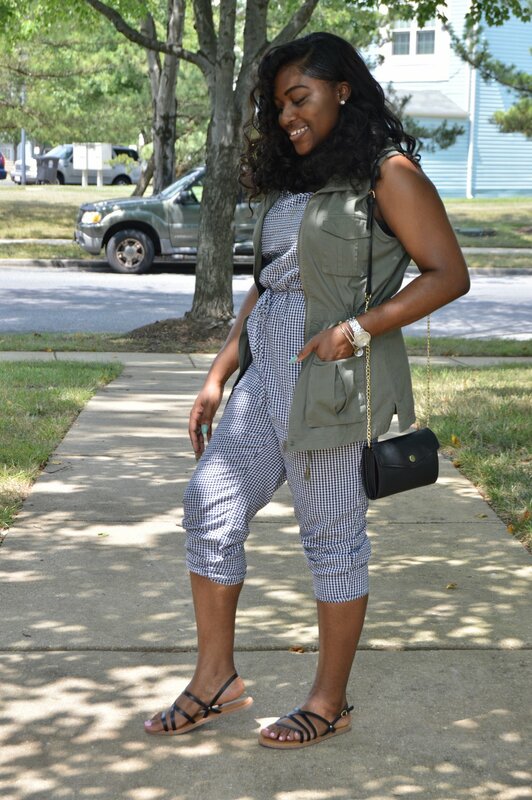 I am a huge fan of jumpsuits and this one has now been added to my list. Whether you need something quick to run errands in or looking for a special piece to wear for a night out, jumpsuits get the job done. Gingham has been one of those trends that comes and goes every couple of seasons but it's actually pretty timeless. Depending on how you style it this print/fabric can be taken from something country to chic. This particular jumpsuit is full length and features thin spaghetti straps so the styling options are limitless. Today I added a utility vest in my favorite color to pull the look together. I essentially wanted a cinched waist illusion and this vest gave me the ability to do that. It's been beyond hot out so sandals were a must here. Small bags are my go-to because honestly I can't be bothered to carry heavy bags in this heat. I absolutely love this look and can't wait to share other ways you can style this piece.